I want to introduce you to a tool that I learned from Master Coach Trainer Brooke Castillo. 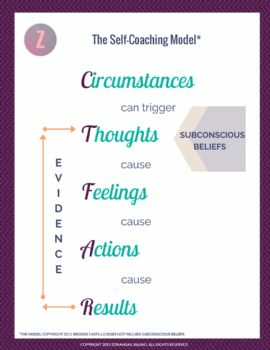 She created the Self-Coaching Model based on her studies of teachers like Eckhart Tolle, Byron Katie and Abraham-Hicks. This helped her bridge the gap between “thoughts become things” as the Law of Attraction teaches, and the application of insights learned from becoming aware of her thoughts. She’s not claiming to have invented the basic concepts it illustrates, only the framework in which they are taught. Circumstances – Things out of your control that happen in the world. Facts that are indisputable in a court of law. Circumstances are not within your control. Thoughts – Sentences in your mind. When they’re written on paper, it can be useful to think of them as a tangible thing you can hold in your hand. Thoughts are within your control. Subconscious Beliefs – Thoughts you repeatedly think without awareness. Subconscious beliefs are within your control. Feelings – Vibrations in your body. When mindfully felt, last about 90 seconds. Feelings are within your control. Actions – Behaviors. How you act in the world. Actions are within your control. Results – Outcome, effect or consequence of actions taken. Results are within your control. Did you notice that 5 out of the 6 are within your control? Seriously, you’re in control of more than you might think! This is good news, because if you’re like me and react to whatever life throws at you, or if you feel out of control of your emotions, you can take your power back. You can choose to change any 5 of those categories and see a ripple effect. Over time and with enough conscious change made, you’ll be living the really awesome life you want. I’ll be diving into each category separately in future posts. For now, I just wanted to drop a quick knowledge bomb in your lap. So what do you think? Is The Model straightforward for you or confusing? Do you agree or disagree that all experience can be categorized as information, which then allows you to make informed choices? Please share your comments! A very thought provoking concept. I like the poster. Thanks for sharing.